EDINBURG - Christine Nott, UT President Greg Fenves, Vallery Valle, Marla Zarate, and Michael Garcia are all UT bound during a send-off event Tuesday Aug. 1,2017 at the Edinburg Conference Center. 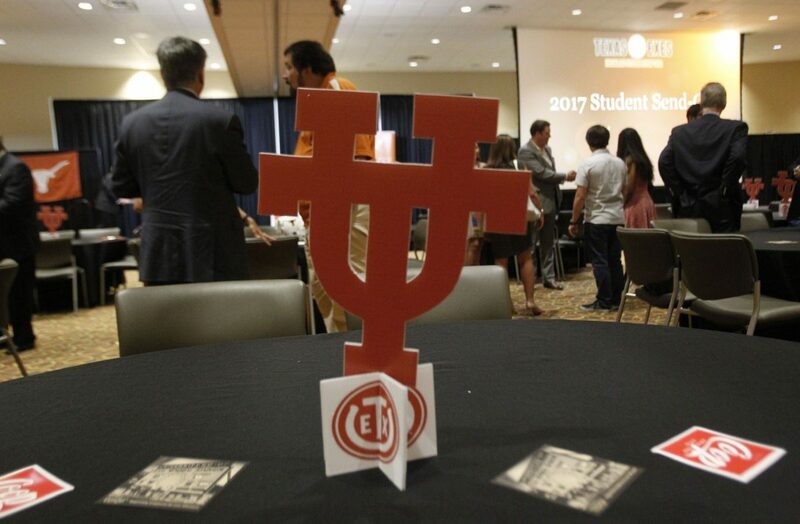 EDINBURG — A tradition that began 24 years ago was commemorated on Tuesday evening with the annual University of Texas at Austin send-off for Rio Grande Valley students. 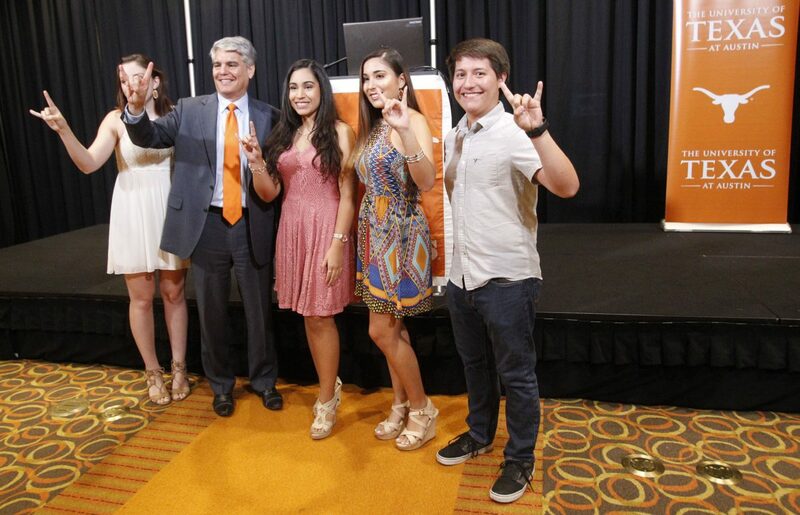 UT-Austin President Gregory Fenves is visiting the Valley to officially welcome 415 area students to the UT family. Through a series of events, the students and their families have the opportunity to interact with university officials and learn more about the transition to college. The second part of the send-off takes place today (Wednesday) in Brownsville where students from Willacy and Cameron counties will be greeted. 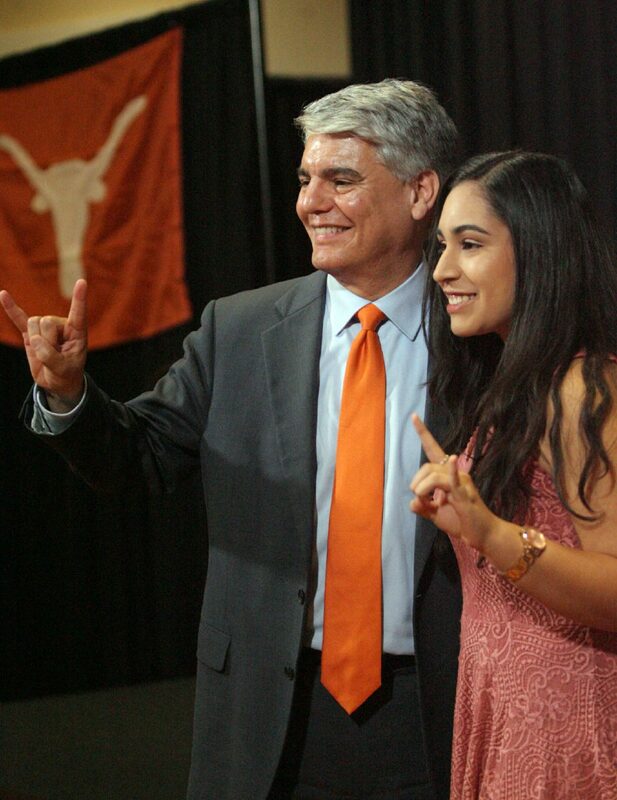 EDINBURG - University of Texas President Greg Fenves and UT scholar recipient Vallery Valle of Nikki Rowe High School gets a send-off by UT exes, parents and friends Tuesday Aug. 1,2017 at the Edinburg Conference Center . EDINBURG - UT president and other reps prepare to officially welcome students and their parents to a UT send-off event Tuesday Aug. 1, 2017 at the Edinburg Conference Center in Edinburg. 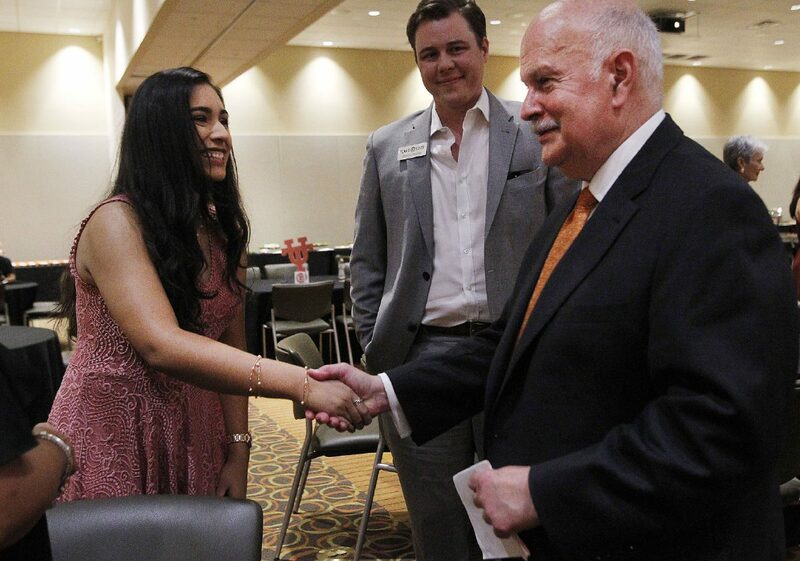 EDINBURG - University of Texas alumnus Judge Ricardo Hinojosa congratulates Vallery Valle during her UT scholar recipient award during a send-off event Tuesday Aug. 1, 2017 at the Edinburg Conference Center. This event was first launched in 1993 as a way to strengthen the ties between the flagship institution and the Rio Grande Valley. The events are hosted in Brownsville and Edinburg, and after the success seen in the area similar send-offs were launched in other Texas cities such as San Antonio. Families first had the opportunity to mingle amongst university officials, alumni and other families sending their students up to Austin. Given the cultural background of the area, which is mostly Mexican-American and strongly rooted in family ties and the desire to stick together, having events like this that give families peace of mind can be an important step. For the Valle family this event brought comfort, Sally said, in knowing there is a support system for the youngest generations of Longhorns. Vallery, 17, a graduate from Nikki Rowe High School in McAllen, is not only celebrating her acceptance into the institution, but also a $10,000 scholarship that can be renewed for the next four years. She was named the Rio Grande Valley Scholar of 2017 by the Texas Exes, a UT-Austin Alumni Association. Using this money, Vallery said she wishes to pursue a communications degree and later decide whether to go into journalism or law. Being the first in her family to move to what she referred to as a big university campus can be stressful, but she said knowing she has a support system makes her feel secure. This is the sentiment Fenves hoped the students and parents take away from these send-offs, which he said the university plans to continue for many years to come.